Chances are that scheduled joint military drills between the U.S. and South Korea will be canceled again as a summit between U.S. President Donald Trump and North Korean leader Kim Jong-un looms. Seoul and Washington had tentatively agreed to start the drills on March 4, less than a week after the scheduled summit on Feb. 27-28. A government official here said, "We are ready to hold the 'Key Resolve' exercises for two weeks starting on March 4, but it looks like the U.S.-North Korea summit will become a major variable." 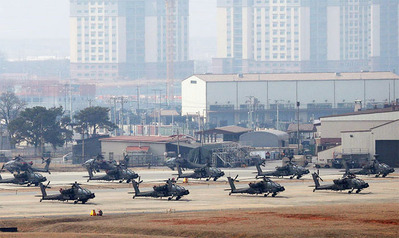 The South Korean military had already considered renaming the drills "19-1 Exercise" to tone down the boastful Pentagon word salad, while replacing the annual "Foal Eagle" joint exercises in March and April with small-scale drills or canceling them. But a military source said, "Even the downsized exercises could be canceled due to the summit given what happened after the first U.S.-North Korea summit in Singapore last year," when Trump unilaterally promised to scrap the drills. As a result, most of the major drills last year were canceled. The two allies considered announcing their resumption late last month but held off amid progress of talks preparing for the fresh summit. "Preparations for the joint military drills are under way. But the most likely scenario right now is for U.S. and [South] Korean troops to hold separate exercises," a military source here said. A growing number of U.S. lawmakers are against canceling the drills again. Democratic Senator Jack Reed, who is a member of the Senate Armed Services Committee, said Tuesday that canceling joint U.S.-South Korean military drills is "inappropriate" at a time when North Korea has refused to take concrete denuclearization steps, according to Radio Free Asia. Republican senator Roger Wicker said there is no reason to postpone the exercises to support nuclear talks.